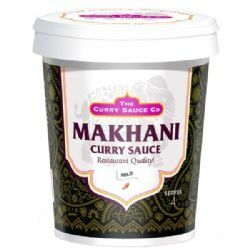 Makhani Curry Sauce for Butter Chicken - made by the Curry Sauce Company, this large tub of delicious sauce contains only natural ingredients. It is a rich, mild and creamy butter flavour sauce, inspired by a Punjabi recipe. Ingredients: Water, Onions, Tomato Paste, Yoghurt (Milk), Tomato in Juice, Sugar, Rapeseed Oil, Unsalted Butter 3% (Milk), Evaporated Milk, Ginger Puree, Salt, Garlic Puree, Onion Powder, Coriander Leaf, Paprika Powder, Ground Coriander, Ground Turmeric, Lactic Acid, Ground Cardamom, Ground Cumin, Chilli Powder, Mustard Powder.